Following a hard fought bidding battle, UK toy maker Golden Bear won the rights to create a series of toys based on CBeebies sensational show Woolly and Tig. 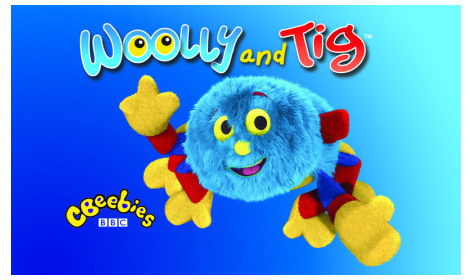 Tattiemoon are the creators of the series that features three year old Tig, and Woolly spider, her constant companion. By facing a different series of challenges in each episode, both characters show the preschool audience how to overcome many basic problems that they may face, any day of the week. Star item in the toy ranges is RC Woolley. Simple for little ones to control, he can spin around in circles, as well as go backwards and forwards moving all of his legs – just like in the TV show! A Jumbo Bedtime Snuggle Woolley is 50 cm wide. Made in beautiful soft blue fabric with a gorgeous embroidered facial expression, who wouldn’t want to cuddle him! Smaller soft toys of Woolley are also available, as well a plastic pullback version that scampers along the floor. A Woolley and Tig Pairs card game completes the Golden Bear range, although other manufacturers are creating collectable plastic figurines, playsets, games and puzzles. Christine Nicholls the Product and Marketing Director at Golden Bear Toys, said: “The Woolly and Tig master toy licence is a great coup for Golden Bear and we look forward to developing a fabulous range for this great property. Our team has many years’ experience within the preschool sector, and together with the creators of Woolly and Tig we feel we can bring something really special to market."